The decisions of whether to pursue a college degree, where to go, and what to major in, are—for most people—the most consequential financial decisions we will ever make. These choices have life-long ramifications, yet they are made by individuals who have barely entered adulthood using information that is, at best, incomplete. There are two common points of view surrounding higher education seen in the popular press, often with cherry-picked statistics to “prove” their claim. The first is that college always pays off, carries little risk, and that a four-year degree should be the goal of every high school student. The second is that college has become so expensive that only a lucky few (typically those with substantial family wealth) will be able to dig out from the crushing debt of student loans. Each of these views are problematic in their own way. Let me be clear, the financial returns to graduating from a four-year college far outweigh any costs for the average student. Given the choice, I would much rather be a 22-year-old college graduate with $30,000 in debt (roughly the national average among those who take out federal loans) than an 18-year-old who decides not to enroll in college at all. The direct financial rewards of a degree are enormous, and don’t even begin to capture the many other dimensions that attending college can positively impact one’s life. However, not everyone receives the average payout from a college degree. There are sizable differences in lifetime earnings, which depend on things like college major, the school you attended, your own abilities, dumb luck, and many other factors. Moreover, many students who enroll in college never wind up graduating; these students often have job prospects closer to that of a student with only a high school diploma. For these reasons, a better way to think about whether college pays off is through the lens of the financial investment, which involves some degree of risk. The typical college graduate will earn roughly $900,000 more than the typical high school graduate over their working life. 96% of college graduates will out earn the median high school graduate if they have no college costs, though this drops to 87% for those who pay $50,000 a year. 74% of college graduates will make at least $500k more than the typical high school graduate if they have no college costs, though this drops to 56% for those who pay $50,000 a year. Even after controlling for potential biases and risks, it’s still worth it. The net present value of a college degree is $344,000 for the average person. But the risk of an investment in higher education is heavily tied to completion. There is little payoff without a degree, and 6 in 10 students who start don’t ever finish. When you take into account the significant number of students who start but don’t complete, there is a 78% chance that attending college will “pay off” if there are no costs. But it is basically a coin flip if your annual costs are $50,000. What a student majors in can also make a big difference. 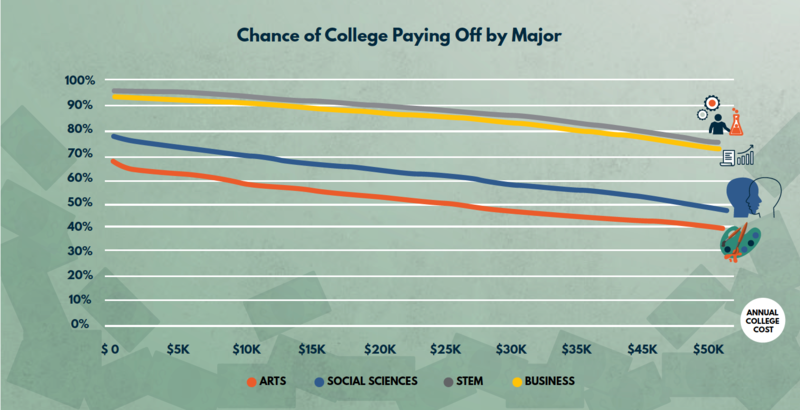 STEM and Business majors are very likely to pay off, even with high college costs. An arts/humanities graduate who attended a private school (and had average costs of attendance) has roughly 50/50 odds that the net present value of their college investment will be positive. This report pulls together data from a variety of data sources to produce evidence on the costs, benefits, and risk associated with attending college. The five most recent waves of the American Community Survey (ACS, 2012-2016), the 1993 and 2003 waves of the National Survey of College Graduates (NSCG), and the 1979 and 1997 waves of the National Longitudinal Survey of Youth (NLSY), are all utilized to generate precise estimates of the entire distribution of lifetime earnings. The technical details of my analysis can be found in my academic1 publications2 on the lifetime returns to attending college. The general idea is that each dataset provides a necessary component to the projection of a current young person’s lifetime earnings and educational outcomes. The ACS and its large sample size provides the most recent data on earnings outcomes across different educational outcomes (both level of education and college major for those with at least an undergraduate degree). The NSCG allows me to follow the same cohort of individuals over several decades and adjust my projections for the fact that today’s 18-year-olds may not look like today’s 50-year-olds when they turn 50 themselves. The NLSY surveys follow the exact same individuals over many years, and contain detailed cognitive (test scores) and noncognitive (personality traits) measures. Accounting for these ability measures is important when evaluating the financial returns to college; estimates which do not account for innate abilities in some way likely overstate the true impact that a college degree has on future earnings. For data availability reasons, I only examine the returns to a Bachelor’s degree for individuals who did not attend graduate school. Each simulation below by its nature must make dozens of assumptions about people’s behavior. For instance, how long are students enrolled in college? Some students take only four years to complete a degree, but many also take six. For students who drop out and never graduate, I present results for students who drop out after 1 semester or after 2 years. There are far too many permutations to show results for every possible set of circumstances. I try my best to show how things change for the most consequential decisions (e.g. by college major rather than the average college student), and lay out each assumption so the reader can make their own mental adjustments. On balance, I try to make assumptions which are less favorable toward attending college in order to provide conservative estimates of financial benefits. I present estimates for college graduates who take 5 years to complete their Bachelor’s degree, and do not engage in any paid work during those years. Thus, even a college graduate who paid no direct costs will still begin their working life behind the average worker who opted against college and entered the labor market at age 18. In the scenarios that include students who attend but do not graduate from college, these students are assumed to have spent two years enrolled. I also assume that two-thirds of college costs are paid up front, and the remaining third is financed by debt (and thus is subject to interest). I assume this debt is repaid based on the Income Based Repayment rules in place during the 2017-18 school year.3 Earnings data are obtained from the full sample of workers who are classified as part of the labor force, meaning they are either employed or unemployed (but looking for work). The estimates below thus do not apply to individuals of any education level who have a high likelihood of leaving the labor force for long periods of time. It is important to keep in mind that each figure presented below only takes into account the individual earnings benefits from college. They therefore do not include the many non-wage benefits correlated with having a college degree (e.g. better working condition, health insurance). Nor do they account for the impact on household income (those with a college degree are more likely to have spouses with a college degree and higher earnings). Figure 1 shows the annual earnings of the median high school and college graduate up to age 65. While the point of this report is to quantify the entire distribution of returns (e.g. risk), it is useful to see the median earnings trajectories to get an idea of why policymakers and other stakeholders push for an increase in college attendance and completion. The typical high school graduate does not earn a substantial amount between age 18 and 22, so it doesn’t take long for the median college grad to overcome the deficit with higher post-graduation earnings. By age 65, the median college grad has out-earned the median high school grad by more than $900,000. A massive difference to be sure, yet this comparison obscures much necessary nuance around the college attendance decision. For one thing, a simple means or medians comparison ignores the fact that not everyone receives the same earnings boost from a college degree. There are vastly different earnings outcomes depending on factors like the school you attend, the major you choose, the state you live in, random luck, and many others. It is entirely possible that the average return to college might be large, but at the same time, it winds up being a bad investment for some people. The focus of this report is thus not the average financial benefit from attending college, but the likelihood that such an investment pays off for an individual who enrolls. For prospective students, the decision of whether to factor in basic living expenses such as rent into their decision of whether to attend college is a complicated and individual calculation which depends on what their living situation is in the absence of college enrollment. If the counterfactual is that you would be living at home with your parents, then any rent costs should be thought of as a cost of college. If you would be living in the same apartment regardless of your enrollment status, then it isn’t fair to allocate this cost as an educational expense. Figure 2 gets at the relationship between risk and cost among college degree holders by examining two benchmarks. The top line represents the likelihood that, over a lifetime in the labor market, an individual with a college degree will make more money than the median high school graduate. From this perspective, there is relatively little risk to attending college. If there are no direct costs to attending college (only the opportunity cost of time spent outside the labor market), there is roughly a 96% chance that a college graduate will earn more than the median worker with only a high school degree. As the annual cost of college increases (horizontal axis), the risk of the degree not paying off goes up. Students who pay typical public school costs6 have a 93% chance of success under this metric, while paying private school prices leads to a 91% likelihood of out-earning the average high school graduate. If direct costs reach $50,000 per year, the probability of earning more than the typical high school graduate dips to 87%. Although an important benchmark, most people probably wouldn’t consider “making more than the median high school graduate” as indicative of success. The second line in Figure 2 shows the likelihood of a college degree-holder earning $500,000 more than the median high school graduate over their working lives. This measure of success varies from 74% for those without any college costs to 56% for someone who pays $50,000 in annual college costs. Those paying public and private school costs have 65% and 61% probabilities, respectively. Another way to understand the risk/return of a college degree is to examine the full distributions of lifetime earnings for high school and college graduates. College graduates have a 40% chance of earning less than $2 million throughout their lifetime, while high school graduates have a 93% of failing to reach that figure. Examining the upside potential, a college graduate is 177 times more likely than a high school graduate to earn $4 million or more throughout their lifetime. Taken together, the results thus far illustrate the considerable financial value of a college diploma. While it is by no means a guaranteed financial windfall, the odds are very high that the degree will at least pay for itself. Moreover, a college education appears to be a de facto requirement for an upper-middle class standard of living (and higher). Despite this strong evidence, much more is still needed before we can make any claims about whether investing in a college education is a winning financial proposition. A dollar received today is not the same as a dollar received 10 years from now. Even if we ignore inflation, getting money sooner rather than later is preferable because it can be invested or spent today. This option value is important in the college attendance context because the benefits of additional schooling accrue later in life. The worker who opts against college receives more money immediately, and doesn’t have to pay off student loans. The figures below that account for this feature use a discount rate of 3%. In practice, this means that I am treating a payment of $1,000 one year from now as equivalent to $970 today. Students who attend college are not the same as those who do not attend at all. For example, individuals who attend and graduate from college score higher on aptitude tests given during high school. This ability is rewarded in the labor market; smarter people (on average) tend to earn more money. But are college graduates being rewarded for their time in college, or for characteristics they possessed before stepping foot on a college campus? This is a question ofcorrelation versus causation, and it is one of the most studied questions in the field of labor economics. If we want to make a statement about whether or how much attending college pays off, this issue must be dealt with. Please see the studies in footnotes 1 and 2 for the technical details of my approach to this problem. Accounting for the above factors, I estimate the net present value of a college degree to be $344,000 for the average person. Theoretically, this means that if I offered an 18-year-old who was about to enroll in college this sum of money today to forego their college experience, they would be exactly indifferent between the money and the college opportunity. Of course, this is an underestimate of the value of college because I haven’t accounted for the value of many non-wage benefits such as health insurance, working conditions, job satisfaction, higher spousal income, and any other positive impacts of a college degree. That said, it gives us a much better sense of the true financial value of a college degree and the limits of what we should be willing to pay for one. There is another big issue with how the financial payoff to college is often framed: many students who attend college never graduate. Much of the financial value of an education is concentrated in the degree, so those who don’t graduate often wind having significant difficulty repaying their debt. Comparing the earnings of college graduates to those of high school graduates, and then declaring that going to college is a good financial investment on the basis of this comparison ignores the very real possibility that students won’t earn their degree. Instead, a useful way to think of college is as a financial investment with an uncertain payoff, which has a high payoff if you graduate, and a low payoff if you don’t (there is consistent evidence of a small return to attending, but not graduating, college7). Pinning down the likelihood of graduating from college is a surprisingly difficult task8 given current data limitations. For the purposes of this report, I will use 60%, which is the average six-year graduation rate for first- time, full-time students attending four-year colleges. Accounting for the change of not graduating, if the annual cost of college rises to $50,000, the odds of the college financial bet paying off are only slightly better than a coin flip. Figure 3 plots the probability of earning more over a lifetime than the median high school graduate assuming there is a 60% probability of actually graduating from college (the discounting and ability corrections are also applied). The substantial risk of attending college are made clear in this graph, with a 78% chance of “paying off” (remember this is a fairly low bar) in the scenario with $0 in direct costs. If the annual cost rises to $50,000, the odds of the college financial bet paying off are only slightly better than a coin flip. How do you reconcile this evidence with the prior data showing relatively little risk? If you are able to graduate college (particularly from a low-cost public school), there is relatively little risk that your investment won’t pay off. There is no guarantee college will make you rich, (although it is your best bet if that is your goal), but the likelihood you won’t at least recoup your investment is remote. However, if you fail to graduate, there is a serious risk you’ll wind up in dire financial straits. The size of the college earnings premium is so great that it makes college a risk worth taking (at least on average), but it is imperative that students understand the risks as well as the rewards. Moreover, these results underscore the need for schools and policymakers to focus on completion. While the students with six-figure levels of debt are often the focus of stories in the popular press, they are the exception rather than the rule. These students make up only 5%9 of the population that takes out student loans, and many of them are in high-return graduate programs like medical school or law school. Arguably the much bigger problem are students who take out some—often smaller amounts— of debt, but never graduate. Institutional stakeholders and policymakers could thus help the greatest number of people by finding ways to improve completion rates. From a federal policy perspective, these results also argue for an expanded role of programs like income-based repayment. The majority of college graduates receive large financial gains from higher education, and are not in need of further subsidy. There is, however, a sizable minority of students who face a significant struggle with their college debt. Policy levers can and should be adjusted for these students. The final dimension of the financial returns to college I explore in this report is that of college major. After the decisions of whether to go to college and where to attend, the decision of what to major in may be the most financially consequential decision a student makes. The difference in lifetime earnings between the top- and bottom-earning majors is close to $2 million.10 On the other hand, the issues of comparative advantage and job satisfaction are difficult to deal with (and have a relatively small academic literature when compared to the body of work on education) given that students choose majors in part based on their own skills and preferences. The statistics below should thus be taken with the large caveat that they should not be used to argue in favor of switching majors for people with very strong preferences for a certain field. It is fundamentally impossible to know what the financial outcome would be for a linguistically brilliant English major who hates math if they were forced to major in engineering. That said the numbers are still quite useful for the type of comparisons we have been making throughout the rest of this paper. Figure 4 shows the (discounting and ability-corrected) probability that a given degree outcome will out-earn the median high school graduate. For Science, Technology, Engineering, and Math (STEM) and Business majors, the odds of success are quite high for virtually any level of spending on school (ranging from ~96% for no college costs to 78% for $50,000 in annual expenses). A social science degree carries modestly higher risk, and arts/humanities grads fare the worst. The average arts/humanities grad who attended a private school (and had average costs of attendance) has roughly 50/50 odds that the net present value of their college investment will be positive. Keep in mind that there is considerable variation within these broad categories. Biology is a STEM major, but it provides roughly the same lifetime earnings as an area/ethnic studies major. Economics is a social science, but it is in the top 5 of all majors in terms of return on investment,11 behind only several engineering concentrations. Given the recent trends in student loan balances among students, addressing the segment of the population for whom college does not pay off will only become more important in future years. Unfortunately, there are no easy solutions. For example, it may be tempting to believe that college doesn’t pay off for the students who barely make the college admission cutoffs, so-called “marginal” students. This does not appear to be the case, as the consensus12 of the recent13 literature14 is that these students have financial returns that are quite large. While it would be an irresponsible extrapolation of the data to say that everyone in the population would benefit from a college degree, the evidence strongly says that today’s marginal student sees large benefits. One relatively straightforward solution would be to strengthen and reform the income-based repayment system, for example by auto-enrolling loan holders.15 Reforming this program has the distinct benefit that individuals who receive large benefits from college will pay their fair share, and those who get unlucky will be protected. Finally, a reformed18 federal accountability system could go a long way toward either weeding out the schools that consistently fail to provide students with an education commensurate with the cost of attendance, or providing the necessary incentives to improve. It is difficult, if not impossible, to characterize the financial value of a college degree in a single number. The largely individualized nature of both the costs and benefits associated with higher education make such assessments quite challenging. In the analysis above, I try to provide the reader with a wide range of both metrics and scenarios to comprehensively communicate the scenarios where a college degree is likely to be a good investment. A college degree has substantial financial value, both on average and for the vast majority of graduates. This is true even after making a number of “adjustments” to lifetime earnings which provide a much more accurate view of the value afforded by attending college. Attending college is not without risk, however. The financial and time investments will not pay off for everyone—especially if we continue to see about half of those who enroll at the average 4- year college not holding a degree 6 years later. Webber, Douglas A. “The lifetime earnings premia of different majors: Correcting for selection based on cognitive, noncognitive, and unobserved.” Labour Economics, vol. 28, June 2014, pp. 14-23, https://www.sciencedirect.com/science/article/abs/ pii/S0927537114000281. Accessed 16 May 2018. Webber, Douglas A. “Are college costs worth it? How ability, major, and debt affect the returns to schooling.” Economics of Education Review, vol. 53, Aug. 2016, pp. 296-310, https://www.sciencedirect.com/science/article/abs/pii/ S0272775715300224. Accessed 16 May 2018. Federal Student “Income-Driven Plans.” https://studentaid.ed.gov/sa/repay-loans/understand/plans/income-driven. Accessed 16 May 2018. Trends in Higher “Average Net Price over Time for Full-Time Students, by Sector.” https://trends.collegeboard.org/ college-pricing/figures-tables/average-net-price-over-time-full-time-students-sector. Accessed 16 May 2018. Goldrick-Rab, Sara and Nancy “The Real Price of College.” College Completion Series, 3 Mar. 2016, https://tcf.org/ content/report/the-real-price-of-college/. Accessed 17 May 2018. Jaeger, David A., and Marianne E. Page. “Degrees Matter: New Evidence on Sheepskin Effects in the Returns to Education.” The Review of Economics and Statistics, 78, no. 4, Nov. 1994, pp. 733-740, https://www.jstor.org/ stable/2109960?seq=1#page_scan_tab_contents. Accessed 17 May 2018. Kelchen, “A Peek Inside the New IPEDS Outcome Measures Dataset.” 7 Sep. 2017, https://robertkelchen. com/2017/09/07/a-peek-inside-the-new-ipeds-outcome-measures-dataset/. Accessed 16 May 2018. Chakrabarti, Rajashri, et al. “At the Y. Fed: Press Briefing on Household Borrowing with Close-Up on Student Debt.”3 Apr. 2017, http://libertystreeteconomics.newyorkfed.org/2017/04/at-the-ny-fed-press-briefing-on-household-borrowing-with- close-up-on-student-debt.html. Accessed 16 May 2018. Webber, “Data.” http://doug-webber.com/data.html. Accessed 16 May 2018. Webber, Douglas “Projected Lifetime Earnings for Bachelor’s Degree Holders by Major.” 22 Apr. 2018, http://doug-webber. com/expected_bachelors.pdf. Accessed 16 May 2018. Zimmerman, Seth “The returns to college admission for academically marginal students.” Journal of Labor Economics, vol. 32, no. 4, Oct. 2014, pp. 711-754, https://www.journals.uchicago.edu/doi/abs/10.1086/676661. Accessed 16 May 2018. Goodman, Joshua, Michael Hurwitz, and Jonathan Smith. “Access to 4-Year Public Colleges and Degree Completion.” Journal of Labor Economics, vol. 35, no. 3, July 2017, pp. 829-867, https://www.journals.uchicago.edu/doi/abs/10.1086/690818. Accessed 17 May 2018. Ost, Ben, Weixiang Pan, and Douglas “The Returns to College Persistence for Marginal Students: Regression Discontinuity Evidence from University Dismissal Policies.” Journal of Labor Economics, forthcoming, https://www.journals. uchicago.edu/doi/abs/10.1086/696204. Accessed 16 May 2018. Dynarski, “America Can Fix Its Student Loan Crisis. Just Ask Australia.” The New York Times, 9 Jul. 2016, https://www. nytimes.com/2016/07/10/upshot/america-can-fix-its-student-loan-crisis-just-ask-australia.html. Accessed 16 May 2018. Hiler, Tamara, Lanae Erickson “A common ground proposal to improve higher education data.” The Hill, 1 Sep. 2016, http://thehill.com/blogs/congress-blog/education/294089-a-common-ground-proposal-to-improve-higher-education-data. Accessed 16 May 2018. Quinton, “Georgia State Improved Its Graduation Rate by 22 Points in 10 Years.” The Atlantic, 23 Sep. 2013, https:// www.theatlantic.com/education/archive/2013/09/georgia-state-improved-its-graduation-rate-by-22-points-in-10- years/279909/. Accessed 16 May 2018. Webber, Douglas A. “Risk-Sharing in Higher Education: A Policy Proposal to Improve Outcomes for Students and Reduce the Taxpayer Burden of Student Loan ” http://doug-webber.com/risk%20sharing%20proposal.pdf. Accessed 16 May 2018.